Arlene, Bret, Cindy, Don, Emily, Franklin, Gert, Harvey, Irma, Jose, Katia, Lee, Maria, Nate, Ophelia, Philippe, Rina, Sean, Tammy, Vince and Whitney. Nice, if slightly American, names, I am sure you will agree. Those of you who follow the weather will be aware that this is a list of names chosen for any hurricanes that have occurred, or are likely to occur, in 2017. Next year we will no doubt be cowering and protecting ourselves from Alberto, Beryl, Chris, Debby, Ernesto, Florence, Gordon, Helene, Isaac, Joyce, Kirk, Leslie, Michael, Nadine, Oscar, Patty, Rafael, Sara, Tony, Valerie and William. Don’t know why Quentin and Ursula don’t get a look in. I’m not sure why anyone ever thought it a good idea to name foul weather with such names, but surely they should have been giving them more appropriate ones... Arrgh my house just blew away, Bloody Hell where did that come from, Crikey what was that, Damn that was close and Effing run for cover might better fit the bill. The weather has been shocking this year, hasn’t it? I mean worldwide, not just in Polomint City where winter seemed to segue straight into autumn. Why am I talking about the weather? Well, I suppose it relates, in a way, with my last (g)ramble concerning the non-prediction of the world’s end. All creatures, bar one, live their lives the same way; they are born, they feed, breed and die. That’s it. Only one species can’t grasp that that is what life is about. Us. Man. We are supposed to be the smartest and most evolved animals on this planet, but when you see the crazy mess we are making of it, that is clearly not true. So what is my point about the weather? We see the Earth as a large rock with some wet bits; we do not see it as being alive, the same as we are. Here’s a thought: what if the planet we live on is actually a living thing and we are a cancer on its surface? Interesting thought? Like any cancer, we are trying to destroy our host and like any living creature, the Earth is trying to ward off the disease. Hence the terrible weather. The hurricanes (and earthquakes too) we have witnessed this year are all, in my ill-informed blog writer’s opinion, the planet fighting back. It has happened in the past. Floods, fires and ice ages have come and gone and the Earth has beaten them all. Its eco-systems may have changed, but it has always survived such ‘disasters’. As I have mentioned in the past, this world would be a better place if man just ceased to exist. One day, that may happen. Indeed, when you watch the posturing of certain world leaders, that day might be sooner than we would want. But whatever happens, there will be no end of the world as predicted by Nostrodamus and his ilk; just an end to the stupidest creature ever to inhabit it. Were any famous or notorious people born on the 7th of October? Of course. Here are some I’ve even heard of. Heinrich Himmler 1900 (Has something similar. ), Andy Devine 1905 (American actor. Made over 400 films. Always seemed to play comedy sidekick roles. 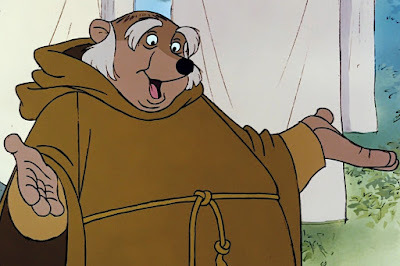 Friar Tuck in Disney’s Robin Hood. ), Vaughn Monroe 1911 (Bandleader and chanter. Here is this week’s first clip... his theme song Racing with the Moon. ), Peter Walker 1912 (Racey car bloke. ), June Allyson 1917 (Actress. Married to Glenn Miller, or was it James Stewart? ), Al Martino 1927 (Singer and actor. Has the distinction of having the number one record in the first ever UK Singles Chart published by NME in 1952. Here is our second clip of the week; that very toon. ), Desmond Tutu 1931 (Smiley bishop. ), Michael Hurll 1936 (TV producer. Took charge of the Two Ronnies. ), Christopher Booker 1937 (Journalist. Original editor of Private Eye. ), Ann Jones 1938 (Tennisy bloke. ), Clive James 1939 (Oz’s greatest wit. ), Oliver North 1943 (Remember him? ), Kevin Godley 1945 (A Hotleg and two and a half cc. After 10CC worked with Lol Creme and latterly has produced music videos for a multitude of acts. Time for a clip, methinks. Hotlegs? 10CC? No, I think something from Godley and Creme. And not one of the hits. Here is something a little bit quirky. Listen out for Paul Gramblercini as the bad samaritan. ), John Mellencamp 1951 (Aka Johnny Cougar, John Cougar and John Cougar Mellencamp. Singer. Here’s his biggest UK hit. ), Vladimir Putin 1952 (See main text: World leaders, posturing. ), Yo-Yo Ma 1955 (Cellist. Want a clip? Here’s a little piece you might recognise. ), Jayne Torvill 1957 (Skatey bloke. ), Simon Bowel 1959 (Promoter. I won’t say what of. ), Sam Brown 1964 (Joe’s lass. Here’s her biggest hit. ), Toni Braxton 1967 (Singer, songwriter, pianist, record producer, actress, television personality, and philanthropist. In fact, a right old smarty boots. Another clip? Here’s Breathe Again. ), Thom Yorke 1968 (A head of radio, or something. Another clip? Here’s an oldie. ), Sami Hyypia 1973 (Footy bloke. ), Tim Minchin 1975 (Comedian. ), Zaheer Khan 1978 (Crickety bloke. ), Madjid Bougherra 1982 (Footy bloke. ), Jermain Defoe 1982 (Footy bloke. ), Gunnar Nielsen 1986 (Footy bloke. What do you mean you’ve never heard of him? He played 19 games for Motherwell.) and Diego da Silva Costa 1988 (Footy bloke.). Teaser time. Yay! Last time I asked you which Scottish international winger of the 1980s and 90s wrote an occasional column for New Musical Express. The answer was former Motherwell man, now a football pundit and sometime deejay Pat Nevin. One for this week? It is World Cup qualifying games weekend (hence all this week’s predictions coming from the lower English leagues) so a World Cup related question might be apt. Who is the only player to have played in three World Cup Finals? Hmm... Try that one out down the pub. And finally, Cyril? And finally Esther, a sad ending to this week’s (g)ramble. On Monday, it was announced that Heartbreaker leader and Travelling Wilbury, Tom Petty had passed away. Though never an out and out fan, I always enjoyed his music so I feel it is appropriate to end with a song that, strangely, was never a hit in Britain but reached the top ten in the US, Canada and (of all places) New Zealand. Ladeez and genullum, I give you the rather lovely Free Fallin'.